A brake rotor is that shiny, circular object that sits behind the wheel of a vehicle. Technically speaking, so is my aunty. To avoid any confusion, for this article the wheel in question is not the steering wheel, but the one with three mates all in contact with the road surface. 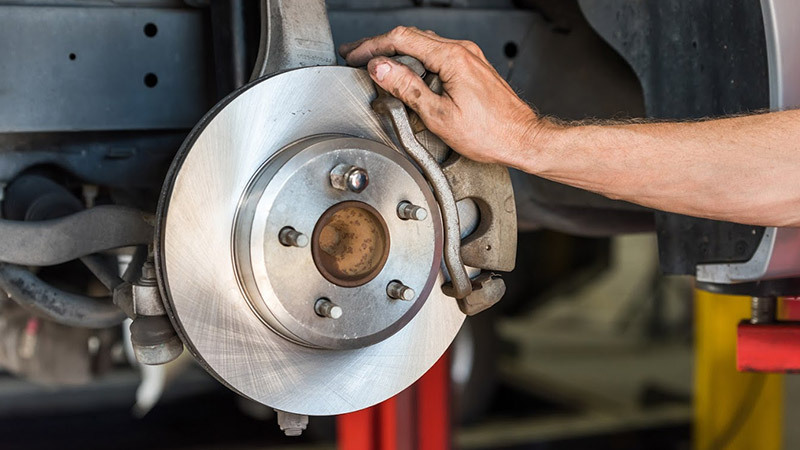 Rotors, or discs, are a key component of every vehicle's braking system, working in unison with the brake pads, calipers and wheels to take your vehicle from go to whoa. It's very much a work of friction and the increasing fraction of the friction over time means your rotors will deteriorate and eventually need replacing. How to tell if I need new rotors? Our need to constantly use the brakes, especially during urban and suburban driving, creates broad temperature fluctuations and general wear and tear that slowly, but still inevitably, affect the performance of the brake rotors. When rotors no longer have a flat surface, or are generally worn, the noise they make will let you know. Squeaking and scraping are the sounds of disrepair you need to heed. The Beach Boys sang of good vibrations; dodgy rotors are all about bad vibrations. If you feel vibration through the brake pedal or the steering wheel, chances are you have warped or worn rotors. Vinyl records have grooves, music lovers feel the groove and if you’re doing well at something, you’re in the groove. These are all good grooves. However, a groove to make you grieve – and a clue to your rotors being on the way out – is the presence of scoring or grooves on the rotor's surface. Such marks are the product of time and usage and, while degrading in this way is perfectly normal, it's also a signal your rotors are due for replacement. Whether acting on their own or all together, the noises you hear, the shakes you feel and the grooves you see all contribute to one outcome: compromised braking and compromised safety. If your vehicle is taking longer to stop, or worse, won’t stop, it’s another sign of an issue with your rotors. We all want to save money and the fact is you can replace your rotors without replacing your brake pads as well. The question is: would you or should you? The benefit of replacing both is that the new rotors and pads start their motoring partnership together. Old brake pads, even if they’re still in good nick, have worn with the old rotors and this will impact on their contact with the new ones. Then again, you may choose not to replace the rotors at all. It’s your decision, albeit an unwise one. Why? Because ongoing use of already compromised rotors can exacerbate warping and even cause rotor breakage. Meanwhile, brakes without brake pads are a recipe for overheating and potential failure of the entire braking system. How much does it cost to change brake rotors? According to our AutoGuru experts, the average cost of replacing front brake pads and disc rotors starts around $300 and can increase to $700+, depending on the type of vehicle and the brake components used. It’s a similar story for replacing rear brake pads and disc rotors. And if you see my aunty out on the road, say hi.